Eleyna, or "Lena" as she does not prefer to be called. Is the second youngest of Queen Llend's fiore daughters. From the southern quarter, she is the manager of the Chambers of Health. 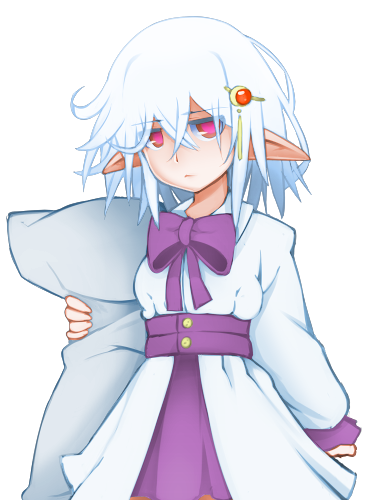 She's a rather sickly sort of girl, and prefers to stay in her manor and sleep, rather than going out to parties. Finding everything boring or bothersome, she is much more content to live in her dreams. Able to sleep almost anywhere. Due the amount of time she spends inside, her health often suffers. She's often under pressure from her older sister Yuliana to do things for her rather than sleep, which annoys her. Yea! it was awesome to get people involved, that's why I did it! Hehe, I feel so proud seeing those buttons. I have taken part in the creative process! Power to the people! Only YOU can prevent design mistake!